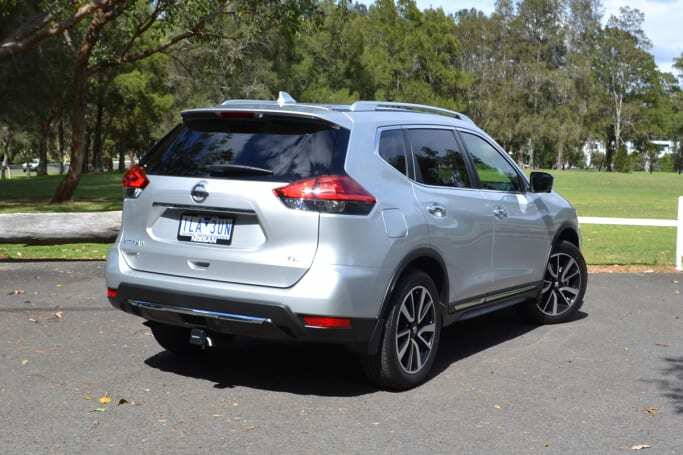 Is Nissan's primo X-Trail TL worth the bucks? 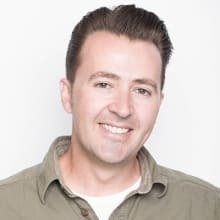 Trusted, big brand. Diesel powered. Four-wheel drive. Top-of-the-range. 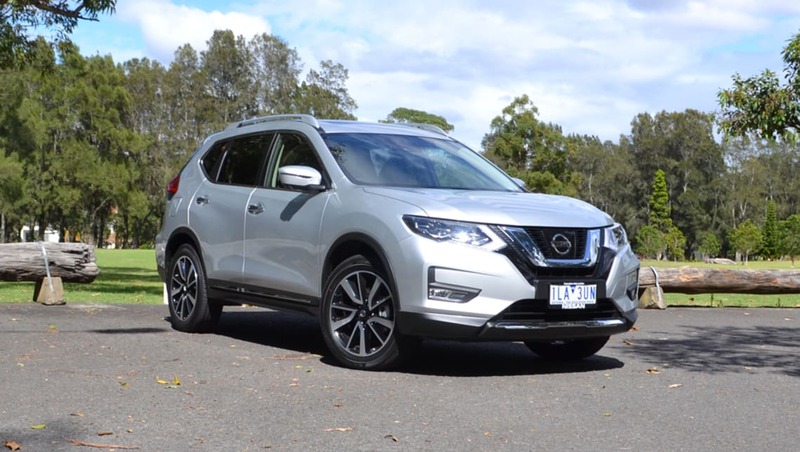 The Nissan X-Trail 4WD TL looks hard to fault, but then again there are some talented rivals out there, such as the Toyota RAV4, Mazda CX-5, and Honda CR-V, which your neighbours drive, and won’t stop talking about. So, is there anything that makes the X-Trail better than those competitors, and are there any drawbacks you should know about? Read on to find out. The TL is the most expensive X-Trail you can get at $47,790. Just an FYI: the Ti grade which is $44,790, has an identical standard features list, but it’s petrol only. You wanted the diesel, right? Okay, that’s three grand more please. If it makes you feel any better, the TL (and Ti) comes with a stack of stuff the other grades don’t. Things like auto-leveling adaptive LED headlights with high beam assist, a panoramic sunroof, motion-activated power tailgate, auto wipers, heated steering wheel, plus heated front and rear seats. A 7.0-inch screen with sat nav nav comes standard on the TL. 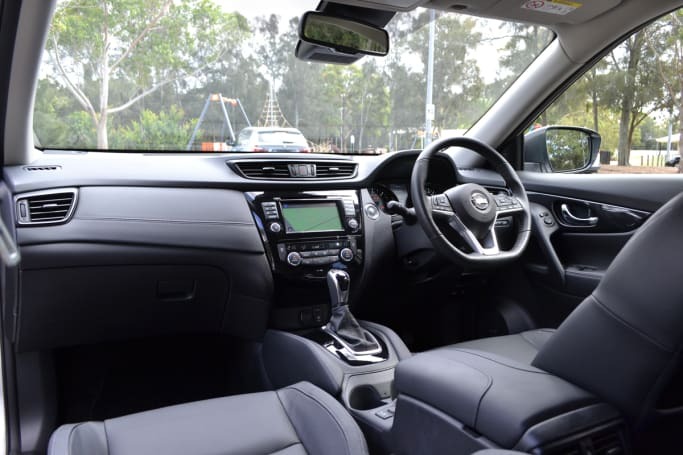 Other standard features include a 7.0-inch screen with surround view camera and sat nav, eight-speaker Bose stereo with digital radio, and tinted rear windows. There’s cruise control, but it’s not intelligent (adaptive). The TL comes with more advanced safety tech, too – you can read all about it below. 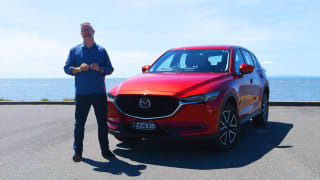 Compared to its rivals, the X-Trail TL undercuts Toyota’s RAV4 4x4 Cruiser diesel and the Mazda CX-5 Akera diesel by about $2000, while the Honda CR-V VTi-LX is about three grand cheaper, although you can only have that in a petrol. But wait, the Renault Koleos Intens 4x4 diesel is a restyled and rebadged X-Trail with the same mechanicals for $47,490, and it has a bigger, 8.7-inch display, plus a longer warranty. Something to think about. Interesting, huh? 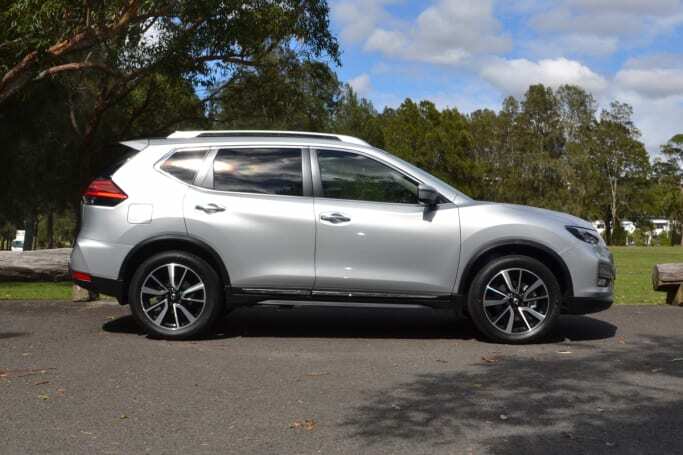 Well it’s not super sleek like a Mazda CX-5, and it’s not as stylish as the Renault Koleos, but the X-Trail is good looking with a tough face, athletic wheelarches, and curvy lines which add a soft flow from the front around to the back. The X-Trail sports a tough face and athletic wheel arches. Much thought has gone into designing an SUV which is easy to use: the A-Pillars either side of the windscreen are set back for better vision, the doors open wider than many SUVs, and the flat roofline and low side step make for better entry and exit. 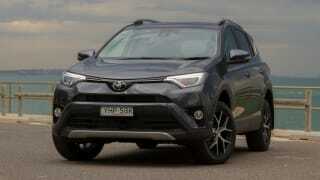 Picking a TL from the rest of its X-Trail family is trickier the higher you go in the range. From the mid-grade ST-L up, they all come with tinted rear glass, roof rails and front fog lights. The Ti and TL come with the sunroof and chrome door sill strips, which are giveaways that you’re looking at high-spec versions. They also come with 19-inch alloy wheels, whereas the rest have 17-inch alloys. From the ST-L up all X-Trails come with tinted rear glass. The cabin design is led more by function than style, which can be a plus. 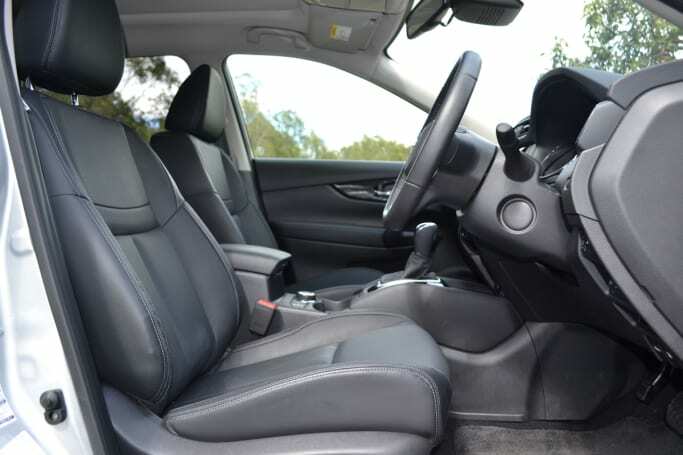 The leather seats are big, the controls are easily in reach, and there are directional air vents in the back. Leather on the dash adds an air or ‘premium-ness’, as does the flat-bottomed leather-trimmed steering wheel. The cabin design is led more by function than style. Having said that, it’s not as refined as some SUVs in the class – but again, for something that's more a tool for family-focused duty, you want Tupperware rather than fancy china. The X-Trail is longer than most of its rivals at just under 4.7m end-to-end. The RAV4, CX-5 and CR-V are all shorter in length. The width and height dimensions are much the same though, at 1.8m wide and a little over 1.7m tall. The X-Trail is made in Japan, which is a good thing, as Japanese build quality is prized. In the design section I mentioned those tall and wide opening rear doors, which make getting in and out easier. Well, along with that, there’s good legroom in the back which lets me sit behind my driving position with space to spare, even for me at 191cm. There's good legroom in the back seat. The sunroof does lower the ceiling height, but there’s still clearance, and it’s not a deal breaker. 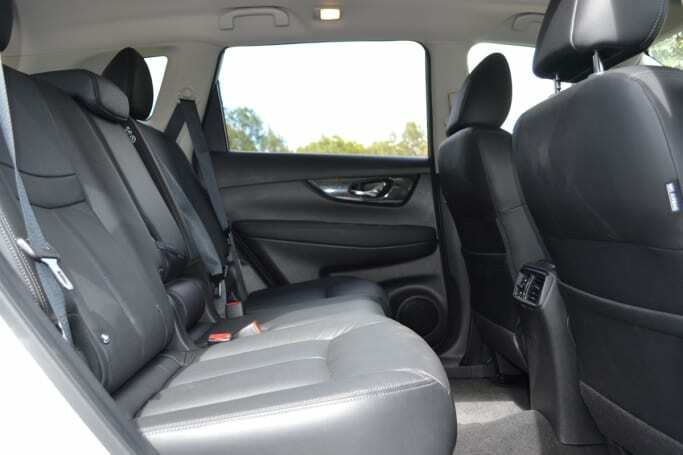 Up front, the cabin is roomy with plenty or leg, head and shoulder space. Those seats are wide, but still supportive. This is a good place to mention the TL is a five-seater. If you’re looking for a seven-seater you’ll need the ST or ST-L grade, but keep in mind those are petrol-powered, two-wheel drives. Storage space is excellent - there's a big hidey hole in front of the shifter for wallets and keys, a large centre console storage bin, giant door pockets in the front and back, and four cupholders (two in the rear and two up front). 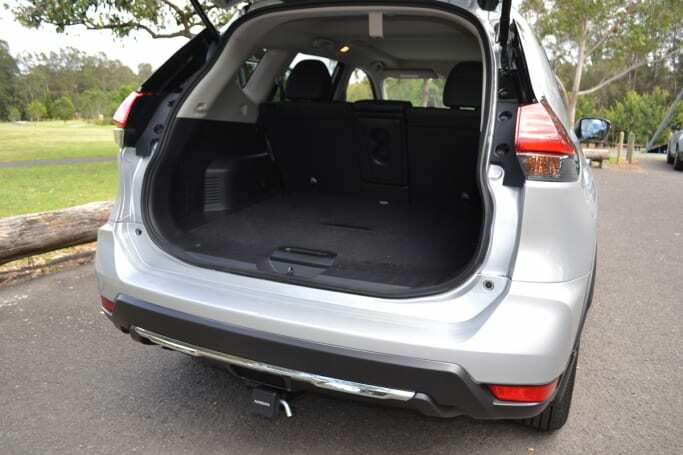 The X-Trail has 595 litres of space in the back. Boot space is also good at 565 litres, and I like the way there’s additional storage under the boot floor. 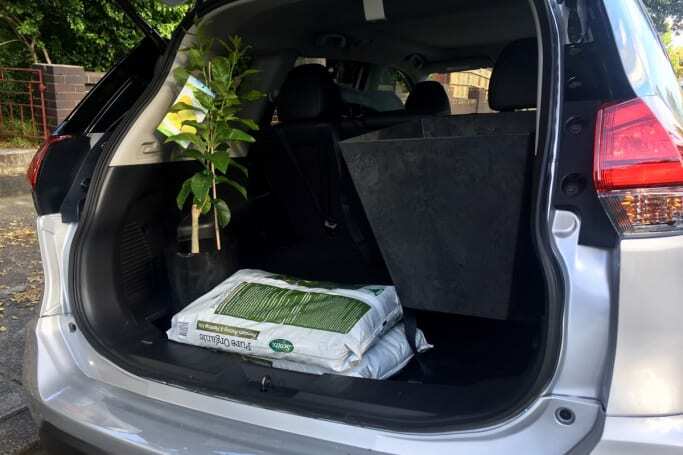 Check out the images and you’ll see how that means I could carry two bags of potting mix, a lemon tree and an enormous pot that the grandmother had gifted to our toddler. All this was carried with ease. The news here isn’t great. While the TL’s 130kW/380Nm 2.0-litre four-cylinder turbo-diesel engine is more powerful and torquey than the old 1.6-litre diesel it replaced in 2017, when combined with the CVT auto the result is disappointing. The TL has a 130kW/380Nm 2.0-litre four-cylinder turbo-diesel engine. The CVT (like most CVTs) doesn’t send drive to the wheels with much oomph. Combine that with maximum torque arriving relatively high in the rev range, and the CVT programmed to ‘shift’ up early, and things become frustrating in city driving. But more on that below. And no, you can’t have your TL with a manual gearbox (which would have been good). The only manual is the entry grade ST.
Nissan says you should use 6.1L/100km over a combination of open and urban roads. My TL’s average mileage was 11.2L/100km according to the trip computer. There’s a mountain of things to like about the way the TL drives – the excellent visibility, the accurate and light steering, the comfortable ride. Then, there are the two things I’m not a fan of, and they're hugely important, the first being the diesel engine in combination with the CVT auto. I’ve driven diesels with the same outputs and they’ve been excellent thanks to torque coming in lower and marriage to a dual-clutch transmission. The issue is most obvious in the city where there's too much turbo lag, and when the mumbo finally does arrive (between 2000-2500rpm) the CVT ‘shifts’ to lower revs and grunt drops off a cliff. On the highway, however, the issue is almost unnoticeable. For serious off-roading a Nissan Patrol is the way to go, but you may be surprised how far an X-Trail will take you. I’ve driven them places you’d be mad to take a regular car. That said, this isn’t a capable four-wheel drive like the Patrol, or a Toyota LandCruiser - it doesn’t have a low and high range setting, but being able to lock 4WD from 2WD, and having a decent ground clearance (210mm) is great for dirt and gravel roads. The X-Trail scored the maximum five-star ANCAP rating when it was tested in 2017. AEB is standard on all X-Trails, but the TL’s system has pedestrian detection, too. The TL (and Ti) comes with safety technology you won't see on the lower grades such as Lane Departure Warning. You’ll also find blind spot warning and rear cross-traffic alert. There are two ISOFIX points and three top tether anchor points for child seats across the second row. I managed to install two cars child seats and a booster child seat across the second row – take a look at the images. 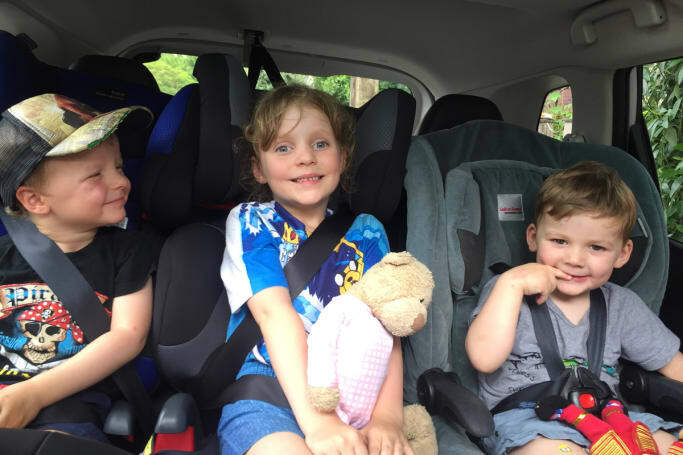 It was a bit squashy, and fine for a trip around the corner to the park, but if you have three kids in car seats you'll need a bigger SUV such as the Nissan Pathfinder, which also has a (single) third-row top tether. I managed to install two cars child seats and a booster child seat across the second row. The X-Trail is covered by Nissan’s three year/100,000km warranty, and servicing for the TL is recommended at 12 month/10,000km intervals. Nissan says you can expect to pay $353 for the first service, $384 for the second, $435 for the third and $440 for the fourth. 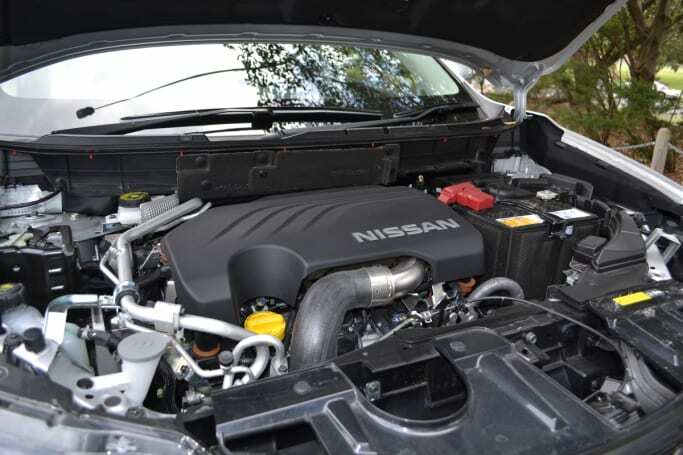 Nissan’s website lists the indicative pricing all the way up to the 12th service. The Renault Koleos is essentially the same car as the X-Trail, just restyled, and the warranty is a five year/unlimited kilometre one with capped price servicing. Just sayin'. Stacks of features, good looking, practical and, apart from the CVT and some diesel turbo lag, the TL is easy to drive. While you’ll most likely become used to the CVT, I’d also test a 2.5-litre 4WD petrol variant, or if you don’t mind shifting yourself – the manual ST.
Also check out the Renault Koleos Intens. Renault has a corporate alliance with Nissan which has allowed it to put its own spin on the X-Trail. It's cheaper, and feels more premium, too. Would you pick the X-Trail over a Mazda CX-5? Tell us what you think in the comments section below. 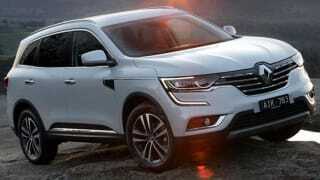 Richard Berry road tests and reviews the new Renault Koleos Intense with specs, fuel consumption and verdict.